Having a clear view from your home or business can make a world of difference to your comfort levels. Who wants to sit inside, looking out a grimy or dingy window? Unfortunately for many property owners throughout the Fort McMurray area, this is the case. When windows are in good condition, they can provide light, comfort and a clear picture of your community, so why not keep them that way? 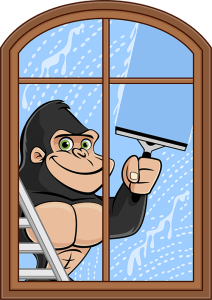 Let our Gorillas help make your space a little more comfortable with our Fort McMurray window cleaning. There is all types of material across the windows around your property. Some of these materials are expected while some might be a surprise to you. As seasons change, your property is up against a new host of problems. For example, winds might pick up during Fall, blowing dust and dirt onto window. Winter and even Spring, however can see salt deposits being left on low level windows or patio doors. No matter what the temperature is outside, your windows are at risk. Foreign materials sit on glass surfaces and can seep into the pores of the windows itself. Sitting dirt and debris can also lead to rot around window frames, leading to drafts and an increase in heating or cooling costs. By making window care a part of your routine, semi-annual maintenance, you can extend the life of your windows and the surrounding areas. The secrets to success for your Fort McMurray window cleaning is to combine tools and technique. For example, reaching ground level windows is easy enough but second floors and above can be tough. 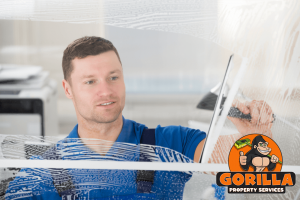 When your windows are within reach, eco-friendly cleaners are used alongside runner squeegees to clear out even the hardest to reach angles of your windows. If you have higher windows, never fear! Our Gorilla Mobiles are outfitted with mobile water sources and water-fed poles. These Tucker Poles enable our Gorillas to clean windows, sills and frames up to four storeys.